On Mac OSX Lion, I use MongoHub as the client tool to view and display my mongodb. MongoHub has native UI for Mac, and provided functionalities for most of my operations. However MongoHub is a little bit buggy and sometimes crashes. 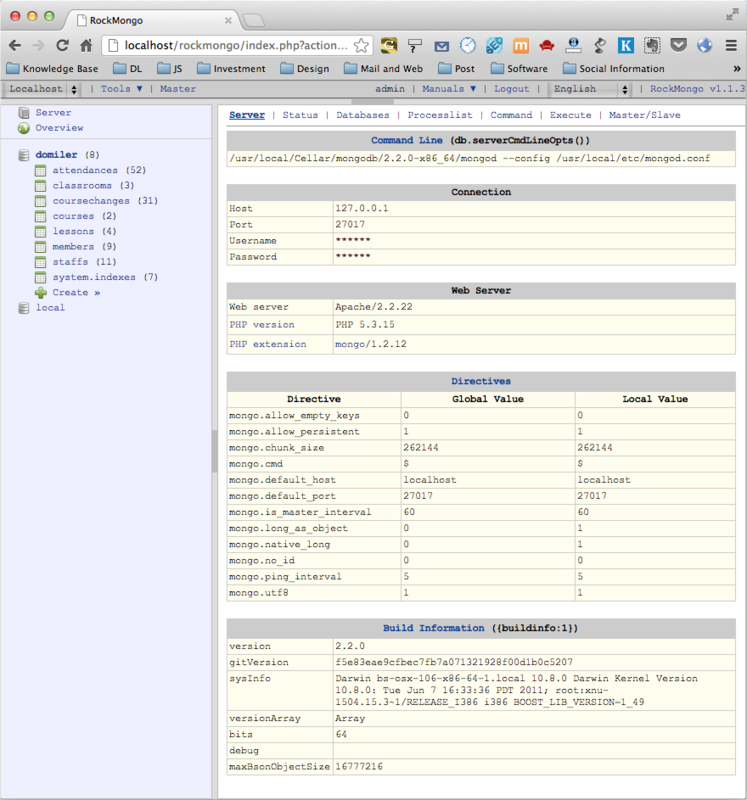 On my apache server, I use RockMongo, an excellent Mongo administrator site to manage my mongodb. 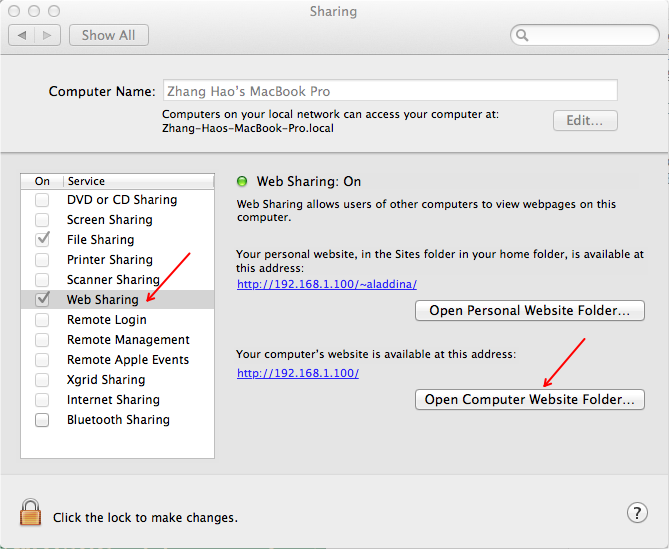 Here is some steps for me to lunch RockMongo on my Mac OSX Lion(10.7). It runs perfectly! Apache2 and PHP5 has already been installed on Mac OSX. You just need to enable it. PHP is disabled on apache2 by default, you need to enable it manually: open apache2 config file with command "sudo vi /etc/apache2/httpd.conf", find the line "LoadModule php5_module libexec/apache2/libphp5.so" and remove the "#" at the beginning to enable php5 module. You may need to firstly install the php tool "pecl"
run command sudo vi /etc/php.ini to open php.ini for editing, if you /etc/php.ini does not exist, copy /etc/php.ini.default to /etc/php.ini, add "extension=mongo.so"
Download RockMongo source code, and copy to your "computer website folder"
You need to run "sudo apachectl restart" to restart apache2 server. ExtJS has an excellent component Grid Panel to display well structured data. The Grid component may be able to fulfill customer's requirements in most of the cases, but once customer need to do customized calculation on the grid, the may need to export the grid data to their favorite tool, for example, Microsoft Excel, for further process. Send request to server and generate data stream with specified file format on server. Cons: need some work on server side, the code here made it works on JSP. Use flash Downloadify to generate a file on the fly. Pros: No server side work, user can choose the file name just like a normal download. Cons: depends on flash object. In my implementation, I didn't take time to resolve the excel format issue, instead I use CSV format as default format. What I need is not to keep the exact style when load. I need further processing on data, and a CSV file can fulfill my requirements perfectly. QML Elements: Detailed description for grouped lists of QML elements as part of Qt Quick. Some samples from Qt demo/examples declarative folders. You can build and run those features and see what QML can do. While my purpose is to have a smooth and beautiful UI for my app on *desktop*, both Windows, Mac and Ubuntu. I may need to spend more time to learn QML and create basic elements for desktop widgets. Then I found some existing QML components here. I played for a while. Here is the screenshot for colibri, beautiful and has covered most of frequently used components. echo "[Desktop Entry]" > "$desktop_file_meenotes"
echo "Package: meenotes" > "$control_file"
echo "Version: 1.0" >> "$control_file"
echo "Architecture: all" >> "$control_file"
echo "Maintainer: Qt developers" >> "$control_file"
echo "Description: Qt components MeeNotes" >> "$control_file"
The new style looks more elegant and clean. I learned C++ programming language when I was a sophomore in the year 1998, and I started to use C++ on commercial software since 2001. I'm insist in using C++ for most of my projects just because I'm a skilled programmer. I have ever read books for C++98, and articles/presentations/papers for C++0x, but never really used it on my project. Recently I watched the keynotes of Bjarne Stroustrup and Herb Sutter on GoingNative 2012, I was motivated change my mind from traditional C++ mindset to C++11. The project of company still using Visual Studio 2008 as the compiler, I practiced C++11 on a side project in my spare time. This function is in my unit test, the purpose is to check if there a line in the canvas with specified start and end point. I like the new features in C++11 very much, and it's very impressive for me that my first C++11 style code works gracefully! You may wonder why I use decltype here. The reason is, when I write other test cases, I may copy the code and make some modifications, if I have the type DGraphicsItemLine here, it's easy for me to miss changing the type. Furthermore, I hope I can get some templates or abstraction so that I can reuse the code in future. Search for "itunes", you'll see an application password item with the name starting with "iTunes Connect:..."
Remove this item, and run Application Loader again, you'll get prompt to input your id and password. This is the difference for applications on Mac and Windows. Windows does not have a centralized place for internet and applications to save password, each browser or application has their own approach to manage passwords. But Mac has the Keychain Access to manage all your passwords. Once you are told that something is wrong with your id/password on Mac, then the first place to go is the Keychain Access, try to remove the stored password and login again. Recently I read the book The Lean Startup. I really learned a lot from the book, new ideas and new concepts. I've been using Pomodoro Technique for several months, and use focusbooster to track my time, log interruptions, completions and discarded pomodoros with pencil on my calender. But when I relied more on Pomodoro Technique. I really need to get statistics and want to learn from it. In addition, I hope I can get some simple GTD functionality into the timer instead of only counter down. 1. Purchased the domain "PomodoroApp.com" on Christmas Eve, 2011. 2. Spent 2 days(12/24, 12/25, 2011) to research the market, investigation the necessary technology, including website, user experience, feature list, and so on. 3. Starting from the evening of 12/25/2011, I started building website. 4. Starting from 12/26/2011, I started coding. 5. My initial plan is really aggressive. I hope I can get a *minimum viable* software in 3 days, and get everything done, including the website. But late I found 3 days can just started the work with a very very rough version, not "viable". 6. In the coming 3 weeks, I spent my weekends and after work hours(0~2 hours/day) working on the product. The New Year Holiday I spent 2 days to travel with my wife, no work. 7. 1/14/2011, 2 days to work for release: final test, refine installation package, config website, grab screenshots, write web pages, set pricing plan, submit to download site/search engine and so on. 8. After released to web, I also spent some time to refine and optimize website, e.g. setup cache for website, schedule some resources to load from CDN for opening speed and so on. After I completed all those work. I started to played web game for a while for a rest. Then started to write this blog post. 2 days for marketing research and technique investment. 5 days, and a number of after work hours in 3 weeks for software design and programming. 2 days for releasing: website, submission.